Information Design (ID) | What is information design and why is it important? From the film Nineteen Eighty-Four 2005. Since one of my primary professional concerns as a user advocate is how users see the information communicated to them, this article from the NYTimes.com Facebook feed grabbed my attention. The article’s author had analyzed Donald Trump’s acceptance speech for his nomination to be the candidate for President from the Republican Party. The article from the NYTimes online itself seems balanced and fair and generally keeps away from arguing a side, but instead, presents statistics that either would support or challenge Trump’s claims. For the most part, the NYT article’s authors managed to state points clearly, keeping an informational tone. I believe that the article helps people who want further information to be able to research for themselves the various claims made in the speech, without too much interference by the author’s personal viewpoints. The references are there so that anyone who wants can fact-check the fact-checkers. My view is that an audience should examine all the issues to make informed decisions based on research done with an open mind. Whatever resources will aid people in that task are useful tools, as far as I am concerned. Since writers, information designers, and graphic designers do not usually serve in the same job functions in organizations as large as the NYTimes, someone other than the author of the text of the article must have selected the image for the Facebook feed and edited the image for the newsfeed posting. The purpose of adding an image to the newsfeed is to grab the FB audience’s attention and get them to click through to the article, whereupon, the audience is encouraged to subscribe to the Times. However, I just wanted to point out that the choice made in selecting the image to accompany the analytical article for the Facebook promotion (see image below) shows how VISUAL RHETORIC colors the impact of information for an audience.This all serves to show how—for the audience—reading and digesting the article rationally is one thing, but being subliminally persuaded via the accompanying images, is quite another one. The selection of an image showing a giant screen view of Donald Trump pulls out of our subconscious every thing we have ever heard concerning the phrase, “Big Brother is Watching You,” from George Orwell’s dystopian novel, 1984, and in fact, the image chosen for the NYT’s Facebook blurb is highly reminiscent of the MGM movie version of that book; the movie was released in the year 1984 and it starred Richard Burton and John Hurt (see image at top of post). [This movie is rated for adults because of some sexual content (R).] I recommend the movie and, most especially, I recommend Orwell’s book. Everyone should read the book, 1984. The book shows a world in which persuasion has become coercion on every level, backed by the powerful arm of a state that has stripped the populace of any individuality, conscience, privacy, or civil liberties. Whatever you think of Trump, I wanted to point out the subtle (or not so subtle) use of images on this Facebook newsfeed blurb that attempt to subliminally persuade you that Donald Trump is going to institute a regime similar to what is found in Orwell’s terrifying vision of the future. In my opinion, the text of the article does a very good job of showing from a rational standpoint some reasons to question Mr. Trump and his candidacy. However, the image used to accompany the newsfeed makes an emotional (non-reasoning) argument in order to awaken doubts about the candidate without having to back them up with facts–just like Mr. Trump’s speech. However, professionals don’t just randomly place images on a page. The photo on the Facebook newsfeed blurb was not the image featured in the article. Rather, the NYTimes.com article featured a normal-sized image of Trump at the podium, just like any candidate ready to start a speech. Obviously, this particular large-scale image of the hall, with Trump at the podium, surrounded by masses of people, with the backdrop of a giant-screen close-up of his face, must have been selected over innumerable other possibilities. The obvious connection made is that Donald Trump is just like Orwell’s powerful party leader, riding the wave of a cult of personality, like those of “the party” in Orwell’s book. Whether this is true or not is not my point. Of course, if the photo of Trump in a hall with giant screens of his face was taken, it must be true that he actually appeared like that in real life. However, the selection of that particular shot at that particular moment to represent that particular text is completely a rhetorical and persuasive choice made by someone involved in the process who is not the same person who wrote the article or even the same person who chose the page shots for the online newsfeed or presumably, the hard copy newspaper. My point is that we as the audience for information need to be aware that images are being used rhetorically in communications and the information we receive can be twisted around by the visuals framing it (see my post on “Framing“). Images are powerful, persuasive tools that often work their persuasion on the edges of our conscious mind. I would have us be aware of what is being said to us, even in our unconscious minds, so that we are fully informed, and able to pose reasoned arguments and refute those we disagree with rationally, rather than posing and refuting strictly by emotional means. By paying attention to and questioning what you see, you can bring what is not noticed more fully into the purview of your reasoning skills to give you more control of the messages that you receive, believe, and send to others. * Listening to this video and reading this article again is very, very interesting from the vantage point of nearly two years into the future, since the talking points in Trump’s speech can be analyzed from our current vantage point for truth and perspective; I would encourage everyone to do just that. Click here to buy the book 1984 by George Orwell in paperback on Amazon. Orwell, George (1949). Nineteen Eighty-Four. A novel. Signet. Radford, Michael, John Hurt, and Richard Burton. Nineteen Eighty-Four. 2005. Shear, Michael D, and Nick Corasaniti. “Fact-Checking the Truth That Donald Trump Promised.” The New York Times, The New York Times, 21 July 2016, http://www.nytimes.com/2016/07/22/us/politics/donald-trump-fact-check.html. This explains, in a nutshell, what information design is all about and, indeed, helps us to understand the dynamics at work when we share information to others in some way. Whether or not the presentation of that information is produced rightly or wrongly, we are designing informational artifacts. What do we mean by the word “information” and how do we tell if design is used rightly or not? Merriam-Webster defines “information” as “the communication or reception of knowledge or intelligence.”∗ Transmittal of information needs to be based in knowledge, or in other words, something you can know. As far as determining whether we are designing rightly or wrongly, you have to understand the principles behind making such value judgements. As I stated in the “Why is ID important?” tabbed section of this website, “Practicing good information design principles from the early stages of design through artifact release minimizes or avoids information failures.” In other words, if you make something or write something or design something, then the way you do it needs to be clear, accurate, and meaningful, avoiding information failures, like misinformation, disinformation, and non-information.∗∗ Such failures of informational design are part of what makes up bad design. This post focuses on the kind of failure known as disinformation, a staple in the pantry of the propagandist. As I defined previously, “Disinformation is when the designer intends to communicate false, inaccurate, or partial information to leave an inaccurate or biased impression or covert lie.” This is a failure to inform, because it is not accurate communication. The person receiving it does not gain knowledge, not real knowledge anyway, as in Merriam-Webster’s “the body of truth, information, and principles acquired by humankind” definition of the word, knowledge. The word truth is the keyword here. Disinformation has been the tool of every manipulative government system from disinformation campaigns in ancient Rome using poetry and slogans stamped on coins to Josef Stalin’s Soviet Russian use of photoshopping before the software program “Photoshop” had been invented. These examples mirror what is happening today, both in textual content and in images. When content is manipulated intentionally to delude, misinform, or mislead, this is disinformation. The creator of the content or designer of the images wants to communicate false information in order to purposely deceive and skew our understanding of the truth. This is the nature of propaganda and why its creation is different from any other persuasive and rhetorical act. This is why such an artifact must be seen for the disinformation that it is: the intention to deceive has been built-in to the content by its creator. The phrase, “Fake News” has become meaningless by people slashing about senselessly with it, their weapon to dismiss any pushback against their “side.” Fake news is a fake cry, unless it includes substantive research to support the disclaimer. What is “fake” about Fake news? Such a determination ends up belonging to whoever is using the phrase. A much better way to pushback against false content—in other words, disinformation—is to examine the process behind the content creation and the design in order to understand its underpinnings and the values of those creating it. Here is a case in point. I use this merely because I saw some people using it which was terribly shocking to me, especially, because I have had a respect for those people and I wish very much that they would realize that to believe it is to believe a lie—and even worse, to distribute such misinformation is to LIE. There is no way around it: if you distribute or share something that is a lie, then you are lying, especially if you have been warned that the content or image is not just misinformation (i.e., an honest mistake) but it is disinformation (i.e., an intentional twisting of truth to purposefully make someone believe that an untrue thing is true). Two world leaders kissing their wives. President Barack Obama giving his wife Michelle a kiss. Why would someone who thinks the photoshopped picture (below) shows and advocates morally wrong actions (i.e., men kissing) find it acceptable to create, post, and share the photoshopped image—a creation which steals actual pictures of these men kissing their own wives—in order to use the mashed-up artifact for disseminating misinformation, which is another way of saying that they are lying by sharing this untruth? The answer is that the creators and disseminators of the photoshopped image are more committed and concerned about the propaganda value of the false image than they are in pursuing and communicating the truth. There is no mistake going on here with this image: the creator of the image purposefully abused truth in order to communicate a falsehood. There is no doubt that this is a kind of propaganda, in which the aim is to further an objective. As much as I dislike showing this photoshopped picture, hence the reason that I added the warning that the picture has been photoshopped, I have to show it to convey how easily disinformation can be created and disseminated and why it is imperative for people to do at least some research to prove or disprove the content and images, which they believe to be true or that they share with others. When a person shares untruths, they are taking part in the lie and are liars, even if they did not create the design or write the content themselves. One’s reputation for integrity goes on the line when you share, make, or advocate for things that are not true. As I pointed out above, it took me less than 30 seconds to find the provenance of the original images used in this mash-up through using a Google Image Search and therefore, I was quickly able to debunk the photo on my own, without having to resort to Snopes or any other fact-finding website. I am not able, however, to explain why anyone would wish to use such a devious means to disperse their ideas or what is being advanced here, other than lies. ∗ “Information.” Merriam-Webster.com. Merriam-Webster, n.d. Web. 8 Apr. 2018. ∗∗ Katz, Joel (2012), Designing of Information, Hoboken, NJ: John Wiley & Sons, Inc.
∗∗∗ Kaminska, Izabella. “A Lesson in Fake News from the Info Wars of Ancient Rome.” Financial Times, http://www.ft.com/content/aaf2bb08-dca2-11e6-86ac-f253db7791c6. The 10 Commandments of Good Website Usability, Jacob Nielsen’s “10 Usability Heuristics for User Interface Design,” are not actually commandments at all, but rather heuristics, or a kind of exploratory underlayment for creating guidelines for usable design. Commandments or not, ignoring these principles should only be done purposefully, not out of ignorance. Everyone who designs information packages that might find their way onto the web (What information packages won’t find their way onto the web?) should know these usability principles and apply them as needed in their designs. You need to have good reasons not to follow established design principles for usability—and you must be objective, not subjective, in your approach. Don’t just say, “I don’t need that. I know what I want.” Too often those who create websites or write content for them don’t know good principles for user-centered design. At some point in the future, I hope to put together a blog series to help us flesh out how these specific principles. In the meantime, the 10 Commandments of Usability will help us form a solid foundation for creating good user-centered communication. When you communicate, you impart information to someone; you share that discreet unit of information—from you to other—so that you can have commonality with whoever receives it. Once received, the ideas about the communicated information may change from the intended purpose of the sender, for example, the person receiving the communication may accept the information as factual or reject it as false; may be enraged or impassioned by it; may be swayed to act or discouraged from acting; may seek for more information or be satisfied with what they already know. Communication is a much more difficult and troublesome event than simply posting, saying, or writing something. Communication is not information upload. Communication is not mechanical upload. The mechanical approach (input > output) to communication has been all too common, however, and there are no signs that this is really changing, despite the availability of online information. True, businesses and other entities, including individuals, increasingly are concerned with users and audience; we should be glad about that. Information about how to do a better job of designing for users is so much more accessible these days. For example, Nielsen’s Heuristics are easily found in multiple places online and, in fact, you can sign up to receive regular academically researched articles and updates from the Nielsen–Norman Group to improve your familiarity with usability principles. I would encourage you to do so. The chance to become a better communicator on every level, including writing and designing for the web, is made much more accessible because of the Internet, everyone knows that. However, the broadening of the accessibility has also made the availability of web creating tools more pervasive and so has spread bad design and insensitivity to audience farther and wider than ever before. How can these 10 “not-commanded” Commandments of Usability be useful to us generally in our day-to-day communication acts? Can those people that find themselves creating content—whether on the web or anywhere else—find any principles that bring value to us when we create our designs? I hope to write a series of blogs in this year to discuss how these 10 principles apply to our communication events and designed artifacts. “Communicate.” Merriam-Webster.com. Merriam-Webster, n.d. Web. 28 May 2016. “Abbott & Costello Who’s On First.” YouTube. Koch Entertainment, n.d. Web. 28 May 2016. <https://youtu.be/kTcRRaXV-fg&gt;. Mind reading machine. Digital image. N.p., n.d. Web. See yourself entering a gallery, walking down a long empty hallway, surrounded by white walls, white floors, white ceilings, rooms illuminated by bright but diffused lighting, whiteness radiating throughout. You see ahead of you a wall that features one painting, hung two-thirds of the way up the wall, in a plain white frame, highlighted by a backlight, which seems to produce a halo around the whole representation. On the painting is a small, barefooted child—a little Asian girl, loosely holding a toy animal by its ear; from the child’s eyes falls one tear. Next, see yourself entering another gallery, the walls are steel gray, the floor, cement. The walls above hold industrial lighting suspended from exposed steel crossbeams. You begin to encounter various bits of rubble—some broken concrete, bits of trash, ash, rebar—and pits dug unevenly in the floor; everything seems broken, disrupted. You enter a room with large black and white images of destroyed buildings one-after-another, on easels, hung randomly at angles, hung on the walls, hung on the ceilings. You smell an ashy heat. You hear the blare of sirens. Then, after seeing a large map of Nagasaki and Hiroshima in Japanese, you see, displayed on an easel, the same painting of the Asian child. What did the painting mean? What did it signify? Did its meaning change from Scenario 1 to Scenario 2? But it was the same picture in the same frame! How could its meaning change? In each of these scenarios, the difference between the interpretations of the painting’s meaning or significance is in its “Framing”—the framing, not the frame. From this example, you can see how the sequence and experience of events and the proximity to accompanying surroundings color the interpretation of meaning, because the set-up for the encounter changed and so has the resulting impact on its significance. Framing can have a powerful, although not necessarily recognized, influence on the way that we interpret meaning as we navigate our daily lives. This rhetorical principle is around us every day and yet, the effect that framing has upon our interpretation of meaning is rarely noticed. Framing, in a rhetorical sense, is the physical (or other) properties that surround an entity or artifact, which change or influence the meaning or signification of the entities in locational or other correspondence with each other. In other words, the things next to each other affect what the things seem to mean to the audience. “Framing is” according to Jim A. Kuypers in Rhetorical Criticism: Perspectives in Action (182) “the process whereby communicators act—consciously or not—to construct a particular point of view that encourages the facts of a given situation to be viewed in a particular manner, with some facts made more or less noticeable (even ignored) than others. When highlighting some aspect of reality over other aspects, frames act to define problems, diagnose causes, make moral judgements, and suggest remedies. They are located in the communicator, the text, the receiver, and the culture at large.” The frame sets up influences through which meaning is affected through the transference of “interpretive cues” from one element to another in its proximity. Transference of feeling through circumstance or environment happens all the time, both intentionally and unintentionally. Who has not walked outside the door of work and let the type of day—sunny, rainy, cold, hot—influence the way that you feel on your drive home? Emotions about what we see or hear, frequently influence us in subtle or obvious ways, seemingly transferred to us through the circumstances surrounding us. But what else might transfer? Along with a transference of feeling, a corresponding transference of meaning can also occur; such transference might also be subtle or obvious. In the previous sunny day example, you generally do not also start thinking that the actual meaning or significance of the day has changed to reflect the positive feelings of happiness that the sunshine brings. You would hardly say and believe, “Oh, it is sunny! This must mean that today is my day to find a pot of gold!” and quit your job. Such a transference of meaning or significance accompanied with sincere acceptance or belief without any logical or reasonable bases for it would be called “wishful thinking” at best, or even, mental instability or illness, if the changes of significance reflected too deeply within the person’s conscious or subconscious mental makeup. We feel and react significantly, based on our emotional influences throughout the day, but really, we don’t let it transfer into what we believe and think about the universe we live in. Actually, however, in addition to being influenced emotionally by the things we see and hear, we very often do let the subtle transference of meaning through framing influence the assignment of significance given to artifacts and happenings around us. The arrangement of entities or proximity of the frame to other artifacts and happenstances often affects the judgements we make about the things we see and hear. We need only to look at electronic media, printed materials, or blogs posted online to see how framing influences our assignment of meaning to artifacts. Take, for example, a newspaper article about any topic. Depending on the articles before it or after it, or the headlines, pictures, or captions accompanying it, you might believe or understand the article itself framed in a way that does not represent the context of the events, details, narratives, or opinions expressed in the article. The framing might actually lead you to understand a meaning for the article completely opposite of the one from which the author intended in writing it. Imagine an article written to honor the career of a particular politician or public figure, but with nearby articles that discuss controversial events that took place under that person’s leadership, framing the original article in a way that undermines the ideas within. Without stating it overtly, you can introduce ideas through framing that are subliminal or subconscious, yet powerful rhetorically. The same can easily be true for articles or “content chunks” found on the Internet or items watched on the television news. In these cases, a visual proximity between entities influences the significance of what the reader finds in the article. Additionally, when there is a particular happening, such as an election, speech, national celebration, holiday, or other such event coming up or just passed, a kind of emotional framing influences us. Advertisers or other “persuaders” use anything in the national or cultural consciousness as a frame for crafting subtle influences to their messages. For example, advertisers use public attention to a coming national event to influence our reaction to some other event, artifact, or idea. A perfect example of this might happen if you frame the promotion of a work-out gym during the media buzz of the Olympic Games: people are already thinking about fitness and athleticism, so they will already have an internal, background noise about the value of getting in shape to bring into the idea of joining the gym. Another example might be selling boats or luxury vehicles during a bull market or when the end-of-the-month job growth stats are positive. The general consciousness of what is going on—the social or political milieu—influences people’s choices about and beliefs in the significance of any artifact of communication, because what people believe and how they act are easily influenced by what “frames” their experienced circumstances and what they see and hear and read. This is another way to perceive a framing influence. The possibilities for seeing this kind of influence are endless, once you start looking for them. Ideas, actions, and beliefs can be influenced by placing communicative artifacts in proximity to surrounding referents or within contexts crafted from either our day-to-day lives or other sources, such as those carrying historical or political connotations. This process is a common, fairly simple, but easily overlooked, concept. But, just pick up a newspaper or watch a nightly news broadcast. Look in the grocery store magazine rack or the aisles at the store. Framing works there too. Influence carries over from one proximity to another, and we often let the meaning of one thing impact the next. In the hand of a marketer, rhetorician, or any person wishing to use persuasion, the tool of framing is powerful. Going back to our painting again, one can imagine the process of choosing the frame for the painting. One might look through the colors on the canvas and choose one or more that “bring out” something in the image, to color coordinate things so that it will match the surroundings in an eye-pleasing way. People often do something like this when they are trying to pick a good tie: “Wow! Sir, Try this tie! The yellow in the shirt really makes this tie pop!” So, you pick a good tie based on coordinating the color scheme. Similarly, using a story to “pull” something out and “feature” that element through framing might be useful, but also might be manipulative and even abusive. Can you see how that might work? For example, I may have a story about veterans’ rates of depression or suicide. I could present the story as “straight” as I could, in other words, as close to the narrative of the author’s intention or context. Or, if I want to let the story illustrate something particular, I could pull certain quotes out of the story or find an illustrating picture and caption it in such a way that would make the story serve my purpose, whatever that may be. I have then framed that story to accomplish a rhetorical (persuasive) purpose, rather than an informative one, no matter what the original intention was in the author’s mind. To a rhetorician, it would be impossible to ignore that every act is a rhetorical one. And, it is true: every word spoken persuades someone of something—why say anything ever if you don’t want to persuade someone of something? Additionally, authorial intention is neither a static concept nor is such understanding as easily attained as might be supposed. However, most people let this entire level of communication and comprehension slip past them without notice. When they do, however, they actually are giving up a portion of their right to weigh things rationally, rather than to absorb the ideas of whomever is trying to slip something past in the stream of unseen and unexamined influence. Kuypers, Jim A. Rhetorical Criticism: Perspectives in Action. Lanham, MD: Lexington, 2009. Google Books. Web. Munroe, Randall. “Xkcd: Board Game.” Xkcd: Board Game. N.p., n.d. Web. 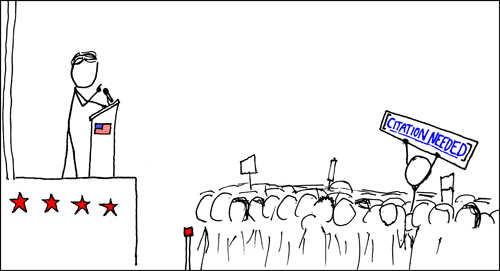 20 Feb. 2016. http://xkcd.com/1566/. My personal Facebook (FB) page, contains a beloved and steady mix of photos, cat videos, lexical jokes (my friends are also word geeks, what a surprise! ), music recommendations, and vacation pictures to drool over, as well as religious, health-related, or political discussions that provide a wide range of proof of accuracy or validity. This particularly steady stream of political, religious, or news-oriented comments ranges from the far-right to the far-left and generally consists of shares or copy-and-pastes from the FB feeds of non-friends, friends of friends, or from questionable blogs. Most of us tolerate this steady steam of commentary and ignore it; some of us, at times, try to push against the ideas with which we disagree. Sometimes, we get caught up in an argument with someone and each person brings out their own set of quotations or citations to support a “side,” usually bringing in the support from unreferenced sources. Mostly, we wish our friends would sort the information grain from the hearsay chaff before they post or share. Frequently, when one follows through the poster’s share to find the original sources for the claims or in order to determine the statements’ accuracy, one finds that somewhere down the line, misinformation has been quoted, the information is out of date, or has been deliberately taken out of context. Such shared posts are often full of inaccurate information. Yet the fact that one’s own friend has posted it on one’s own feed tends to give the post the weight of their approval, which in the same way, puts one’s own integrity on the line with sharing it to someone else. This is doubly why one shouldn’t just share without verifying the facts as much as possible. This is true not only of “political” shares but also very frequently is also true about shares that relate to science, experiential, or medical “facts,” such as claims for health cures (“Drs recommend you never eat sugar….”) or environmental issues (“Something-or-other is poisonous because of such-and-such….”) or experiences (“I was kidnapped by aliens and taken to….”). There are some claims that are proven true and worth sharing—don’t get me wrong. However, not all claims are created equally. The person who posts must at least try to verify the things posted or shared before posting or sharing them. Google the key words, check it out on Snopes.com, or follow the trail of blogs that quote that resource. Usually, it takes less than one minute to find out that something is questionable or already proven to be false. Доверяй, но проверяй—“Trust, but verify,” as the Russian translates into English—an old Russian saying that became well known in the western world when Reagan used it in talks about Soviet nuclear disarmament to say that the verifiability of the procedures should justify the level of trust bestowed in the process. Don’t blindly trust, but check that your trust is merited by the facts. To take it a step farther, only believe and share what you know to be true, as verified to the best of your ability; don’t blindly repost what people say because the name of a famous person is attached to the post or image, or because it tickles your ear and you wish it were true, or that you are “friends” with the poster. Your respect for your friends does not stretch to the point where you must accept as accurate those things that are not accurate. When your friends don’t bother to check on the things that they share with you, why should you, like a robot, do the same and share untrue things with your friends, risking your own reputation? Don’t squander good will by posting things that you have not bothered to vet for accuracy, because your reputation for truth suffers when you do not at least try to verify the share. Everyone makes mistakes in this, but some people don’t even try to not make mistakes. Don’t be one of those people who just shares without fact-checking, because your integrity is at stake: you want people to believe what you say and take seriously what you believe. How often have you read or seen something and then wondered, “For whom was this written? To whom were they speaking?” All too frequently, speakers and writers speak and write to themselves or to people just like themselves, rather than to the actual audience that will hear or read their words. Case in point: Have you ever listened to a public discourse or sat in an introductory-level class, where the speaker assumes that the audience possesses a base knowledge of the topic that is inappropriate for the venue, by using insider’s vocabulary that is incomprehensible to newcomers to the topic? Most of us have experienced this. Such instances are examples of unclear communication because the words were not aimed at the actual listeners or readers, but rather, primarily, aimed at impressing the speakers’ or authors’ peers with their own intelligence. Have you ever seen a sleekly designed website or other product that you can’t actually figure out how to use? Again, such creations were not designed for the user of the product, but rather, to impress other designers. The obvious—but not always recognized—issue is that if an audience can’t understand the discourse or the user can’t use the product, then the process of composing or designing has failed its primary mission: to reach its audience. An audience receives what it is actually presented with, not what the mind of the creator thinks it has presented; if the audience can’t understand or misunderstands the written or spoken text, then the impression left on them will be outside the intended meaning of the discourse. Therefore, to communicate, an author or speaker must take the actual audience into consideration right from the start when composing a message. To do so, the author must understand the audience—both the primary and the secondary audience that will potentially receive that message. Such things as sentence complexity, the use of metaphor and figures of speech, first or third person, personal or impersonal tone and voice, word choice, directness and familiarity, formality, and other factors need to be consistent and intentionally used, rather than randomly applied, in order to communicate effectively. Furthermore, all of these elements need to be geared toward the actual audience that will be receiving the discourse, if misunderstanding is to be avoided and intended meaning is to be communicated. The primary audience is the target audience, the one that writers or speakers intend to reach with their discourse; the communicative needs of that primary audience must be clearly understood by the speaker or writer before they speak or write. Identifying who that audience might be would be the first step to understanding how to reach them and this might be accomplished by things like brainstorming ideas of who you think you want to reach and bouncing those ideas off of others with similar focus to yours. Additionally useful would be some basic demographic research to further identify the general characteristics of those people whom you identify. Learning the actual needs and wants of those you identify would be the second step, something that only research—asking questions, conducting surveys—will actually find out. Don’t assume that you know what people think, because such assumptions will undoubtedly result in a skewed idea of your audience that will more than likely represent stereotypes, rather than actual people. Targeting stereotypes for your audience is something that will be noticed by the readers and listeners and will more than likely alienate them and backfire on your intended purposes. Another important consideration—especially in this day of digital text—is that in addition to your primary audience, you have a secondary audience. By trying to imagine how the text or discourse you are composing will be shared to others, you can attempt to take that secondary audience into account. For example, is your blog geared to teachers? If so, then your blog message might be seen by students, parents, or your principal or the school board members that have hiring and firing power over you. Thinking in advance about where your discourse might be shared is only common sense, but how often do people fail to account for it? Although impossible to take every possibility into account, by trying to imagine potential ways that your discourse might be disbursed on media other than the original platform, you can anticipate an additional audience and take that information into consideration in further selecting an appropriate style and tone for what you publish or present. Planning with audience awareness in mind is all about how to make a connection and how you, as an author or speaker, can be understood clearly and unambiguously by the audience that is on the receiving end of your communication event. Piraro, Daniel. “Bizarro Comic Strip for February 01, 2016.” Comics Kingdom. N.p., n.d. Web. 1 Feb. 2016. <http://comicskingdom.com/bizarro/2016-02-01&gt;. So just how does a person find the original source for an image on the Internet? Images so often float around online, so how can a person get down to the real facts behind an image? One way is to conduct a Google Image Search. Here is the Google Image Search box. Click the image to try it yourself. With a Google Image Search, you can upload an image or enter the image’s URL (the web address) into a Google search box and Google will open a page that shows various matches to the image. From there, you can look through the search results and often you can find out who is the creator of the image or the source of its original publication or appearance, along with a variety of places in which the image has since appeared (like various blogs or websites). Oftentimes, you will see versions of the image in different resolutions or from different aspects. This is one great way to test if your image really is what you think it is, since often, through a Google Image Search, you can find versions of the image in which it has been slightly (or greatly) manipulated by an image editor like Photoshop. Another plus for using Google Image Search, is that it helps you as the poster to be a good Internet citizen by your finding and giving credit to the artist or creator of the image for their work and to supply your audience with a link to the original publication or the artist/creator’s website. Using Google image search is not the only way that you can learn the provenance of an image, but it is a great place to start and is easy and free to all. There isn’t really an excuse not to search out the origin of the images that are being used. After all, knowing as much as you can about the images that you post on Facebook or any social media, should be a no-brainer, because if you post something that is inaccurate, especially if it is obviously fraudulent or manipulated, it doesn’t reflect well on you and is not going to accomplish the rhetorical purpose that you have intended by your post.